This is the first half of a show recorded live at the Dublin Podcast Festival 2017 with guests Deirdre O’Kane and Naimee Coleman. 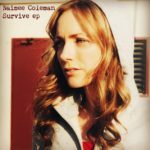 In this episode Naimee Coleman picks up where she left off in our last chat where she had decided to get back to writing and playing music having taken 7 years off to be a mammy. She talks about getting back into gigging and tells us about her first night back on the stage. As well as chatting she plays two songs live; a new song “Unravelling” and “Your Arms” and a fan-favourite from her second album “Bring Down The Moon” (this performance can be heard at the end of part two out soon!). Naimee made her first record soon after she left school and her debut album “Silver Wrists” was a hit in Ireland and around Europe and had hits with “Care About You”, “Ruthless Affection” and “Sometimes”. Four years later she released the critically acclaimed follow up “Bring Down The Moon”. While in LA she wrote and recorded the as yet unreleased follow up “Survive”. She is set to release an EP of new tracks very soon. Naimee Coleman is lovely, funny and full of great stories.